If you are looking for some tips on living a long, healthy life, look no further than Greek coffee, which according to scientists is a key ingredient to staying youthful, greekcitytimes.com reports. Nowadays, the life expectancy of humans has increased significantly, nevertheless, there are, of course, some people who live a lot longer than others and many of those reside on of Ikaria. Many scientists have made their way to this Greek island in search of answers as to why locals here live longer. New York Times best-selling author Dan Buettner and his team, declared Ikaria as one of only 6 Blue Zones globally. A Blue Zone is defined as a place where the environment is conducive to old age and in Ikaria, it was discovered that residents here are several times more likely to reach the age of 90+ compared to normal. On Ikaria instances of cancer, cardiovascular disease, and diabetes are significantly decreased, and dementia is rare. Some of the most important significant of studies conducted here has to do with Greek coffee, which is consumed by locals every day. Greek coffee is not only seen as a big part of Greek culture but it is now being viewed as a drink that is good for our health. Extensive research on Greek coffee has revealed the presence of strong and powerful antioxidant ingredients that are connected to good heart function, type II diabetes protection and much more. The study of Ikaria focused on residents aged 55 to 100 years of age and investigated the relationship between coffee consumption and its impact on the health levels of the elderly residents of the island. The results showed that over 87% of participants consumed Greek coffee every day and had the best arterial health, with their arteries behaving like those of much younger people. 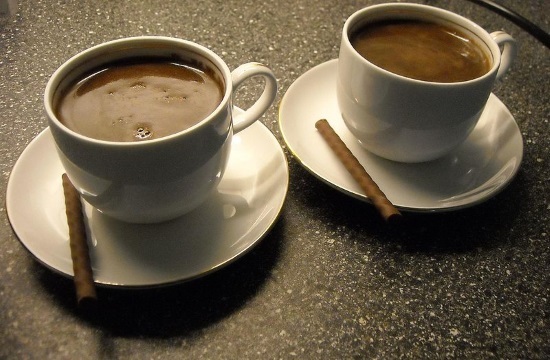 Researchers assume that certain ingredients in Greek coffee, such as the antioxidants mentioned above, are likely to boost arterial function, increasing the body’s ability to absorb nitric oxide. Even for those who suffer from high blood pressure, coffee consumption proved to have a better outcome on their endothelial function. Researchers therefore concluded that Greek coffee, with its rich in polyphenols and antioxidant content, seems to have a wide variety of benefits for good health.